Last week we premiered He Ain’t Heavy at Hull Truck Theatre! It was an absolute pleasure to do one of the most grown-up things I’ve done to date, whilst staying with my mum. It was brilliant to have almost all the team in the room at the same time, and to have a lot of fun whilst working hard. Thank you to Hull Truck Theatre and Hull City Council for their generous support. What really struck me performing this for the first time was the warmth from the audience and their enthusiasm to become part of the performance. We met some incredible people and I married 4 brilliant individuals. I was also really grateful for the feedback both in the post show talk and in the bar after the shows, especially for the opportunity to talk with people whose family is like mine. It’s nice to know we have a shared version of normal. Sophie and I were also lucky enough to deliver circus workshops in local schools working with young people with special education needs and behavioural challenges. It’s difficult to summarise the experience of working with around 100 children as they are all so different and each were working to their own goals, but overall we were impressed by every child’s excitement and focus as well as their brilliant imaginations. Two of my favourite moments were noticing one boy moving in swirling dance-like patterns whilst twirling poi and at another school playing catch with a young lad who was delighted every time the ball passed between us. 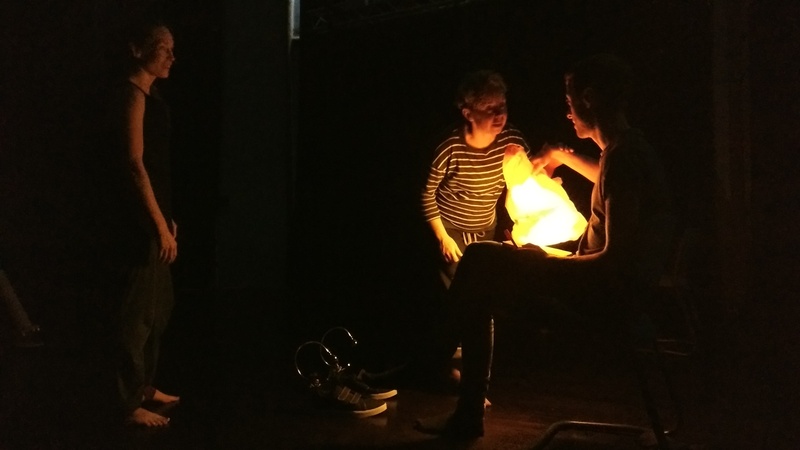 We are very excited about performing again this week as part of Bristol Circus City at the Trinity Centre, so please join us there if you’d like too see the finished show. We are also running a circus workshop for siblings and young carers on Thursday 11 – 12pm, which is completely free. The title of this blog post makes it sound like we are rock stars. That’s right, the long awaited, highly anticipated tour dates for He Ain’t Heavy are officially announced. You can buy your tickets RIGHT NOW. Arts Council England, Hull Truck Theatre, Jacksons Lane, Pavillion Dance South West, Ausform, The Elmgrant Trust, The Trinity Centre, Circomedia, The Point Eastleigh, The Invisible Circus, Yard Arts, Bristol Autism Support and Hull City Council. Last week was a rollercoaster in many ways, including the massive surges of adrenalin working on the new swing, screaming at possible ghostly encounters and a trip to A&E (everyone’s fine) and this was before we had even started re-sculpting the structure of the show! I had the absolute privilege of working with both Jimmy Whiteaker AND Charlotte Mooney, in the same room at the same time! Our aims for the week were to better integrate the aerial and to mould both new ideas and familiar scenes into a clear structure. In reality this meant writing every scene on a piece of paper, discussing each, moving it around, trying something on stage which would or would not work and then repeating. Whilst not everything worked how we expected it to we did finish on Friday with a clear structure and musical plan; as we were lucky to be joined by Alexandra Hamilton Ayres and Shaun Dawson (Turtle Key Arts) for one afternoon. It was also a lovely space to work in and we received a lot of support, particularly from Nick, as well as from everyone else in the building. I’m really looking forward to coming back to Jacksons Lane for the show in November! Unfortunately all the photos I’ve taken are of bits of paper on a black floor which isn’t very visually interesting, so here is a photo of the breakfast Sophie made me instead! A lot has happened in the 9 months since I last posted a blog…where does the time go! Most excitingly He Ain’t Heavy is now being produced by Turtle Key Arts; Ali King has taken us under her wing as we gear up for touring in the autumn and beyond. So after months of planning, funding applications and creative chats we are now back in the rehearsal room. 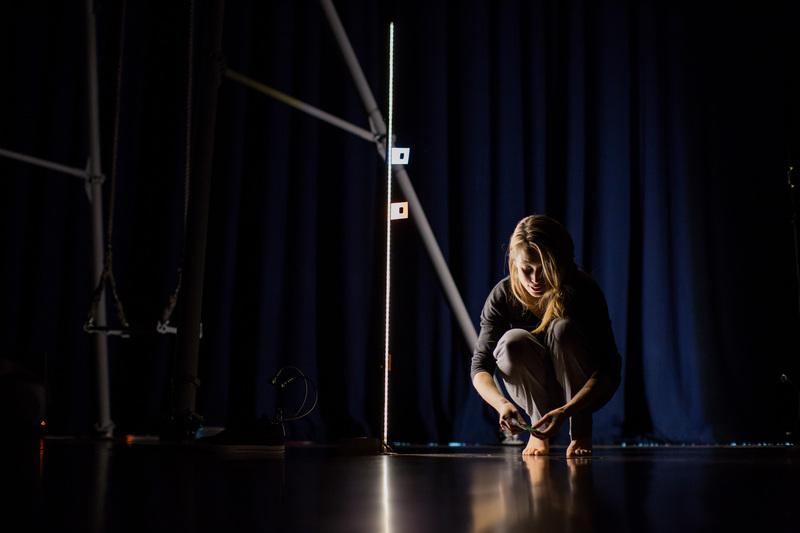 Last week we were incredibly lucky to have a summer residency at Pavillion Dance South West. 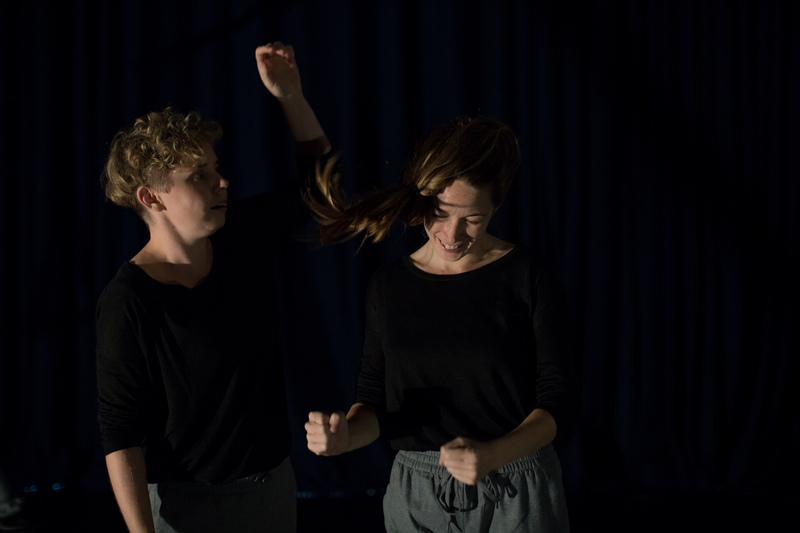 We were very grateful to everyone there for such a brilliant experience and it was a fantastic opportunity to spend focused time revisiting the movement from the show and exploring how we can develop it. Sophie and I now have a ‘He Ain’t Heavy’ vocabulary of movement that includes “Head-Lock and Roll” and other restraining techniques we happened to find on the internet! It was a hugely productive week for finessing and generating material, as well as giving us a heads start on clarifying the overall structure. For one morning, whilst I worked on straps, I was joined by Jan Roe who was drawing as I moved. It was such a lovely experience to share creative space with Jan and an insight to discover she feels the movement as she draws it. 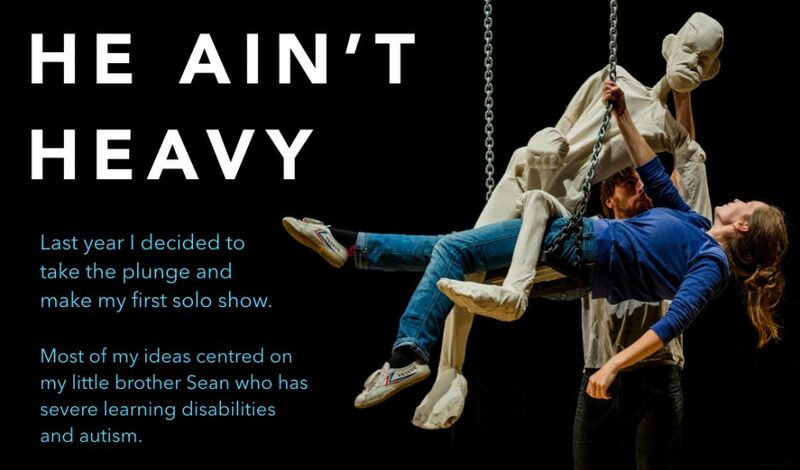 On the 12th November we trialed our first He Ain’t Heavy workshop in partnership with Bristol Autism Support and Circomedia. It was an incredibly positive morning where we met some very talented people (pictured above), had a lot of fun and were able to test out our new workshop structure. Jimmy and I will be delivering these workshops in Bristol and across the U.K. from 2017….get in touch if you would like more information! I have in fact been for a few walks since we completed the two previews of He Ain’t Heavy last week; I’ve walked to my wife’s allotment, I’ve walked along the Bristol to Bath cycle path (and experienced the most unusual heckle to date – “scrumdiddlyumptious”) and today I walked to Ikea under the pretence of returning some fairy lights that we didn’t need for the show, but in all honesty I fancied some 50p chips. This week I’ve also taken a stroll around all our work to examine if we have done what we set out to do. I read over the ACE reporting requirements and experienced a sense of sinking disappointment; not that I had to write an evaluation but that I only had 9000 characters to cram my brain into… I was geekily relieved to discover I can also attach a self evaluation report! It’s Tuesday and we are at Trinity working away. Tomorrow is dress rehearsal and Thursday are our previews for an invited mixed audience. The idea to have a friends and industry special preview has come about because even though we are making and finishing the piece now, it will not actually premiere until next year. We are aiming to premiere and tour with a big bang next year including different type of spaces and places including theatre as well as village halls for rural touring. This is the moment when we see how everything comes together and sharing that with an audience is essential. A performance is never complete without having been shared. It’s also impossible to tell if what we have made resonates in the way we think until we’ve seen your reactions. If you’d like to come let us know, there are still a few spaces left. Wish us the best of luck and if you’re coming see you Thursday! 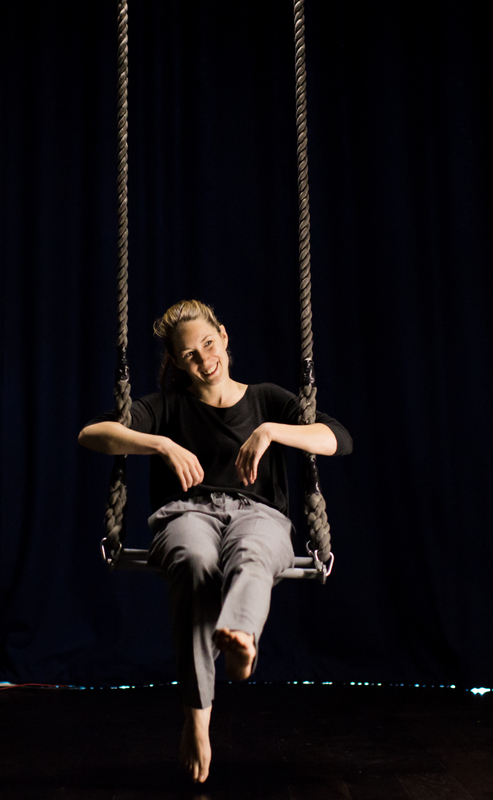 Producer of He Ain’t Heavy for Grania Pickard and Oddly Moving Circus Theatre.